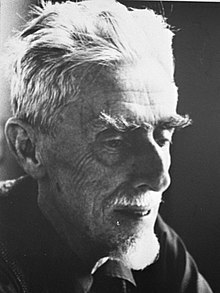 Maurits Cornelis Escher (17 June 1898 – 27 March 1972) was a Dutch graphic artist who made mathematically inspired woodcuts, lithographs, and mezzotints. His work features mathematical objects and operations including impossible objects, explorations of infinity, reflection, symmetry, perspective, truncated and stellated polyhedra, hyperbolic geometry, and tessellations. The unknown mountain nests in the inhospitable interior of southern Calabria are usually connected only by a mule track with the railway that runs close to the coast: whoever wants to go there has to walk on foot if he has no donkey at his disposal. I think back to that warm afternoon in the month of May when we the four of us, after a long, tiring ride in the harsh sun, packed with the heavy burden of our backpacks, sweat-dripping and a little gasping, entered the city gate of Palizzi..
version in original Dutch (origineel citaat van M.C. Escher, in het Nederlands): De onbekende bergnesten in het onherbergzame binnenland van Zuid-Calabrië zijn meestal slechts door een muilezelpad met den spoorweg, die vlak langs de kust loopt, verbonden: wie er heen wil, dient te voet te gaan zoo hij geen ezel tot zijn beschikking heeft. Ik denk terug aan dien warmen namiddag in de maand Mei toen wij met ons vieren, na een lange, vermoeiende tocht in de barre zon, bepakt met de zware last onzer rugzakken, zweetdruppelend en een beetje hijgend de stadspoort van Palizzi binnentraden..
Now, I should like to say something else to you about the connection with music, primarily that of Bach, i.e. the Fugue or, put more simply, the canon.. .It has a great deal in common with my own motifs, which I make turn on various axes too. Nowadays I have such a powerful sense of relationship, of affinity, that when I am listening to Bach I frequently get inspired and feel an overwhelming instinct for his insistent rhythm, a cadence seeking something of the infinite. In the Fugue everything is based on a single motif, often consisting of just a few notes. In my work, too, everything revolves around a single closed contour..
version in original Dutch (origineel citaat van M.C. Escher, in het Nederlands): 'Nu wou ik je nog wat zeggen over het verband met muziek, en wel in hoofdzaak met die van Bach, d.w.z. de Fuga, of eenvoudiger canon.. .Het heeft heel veel van mijn motieven, die ik ook om verschillende assen laat draaien. Ik heb dat gevoel van relatie, verwantschap, tegenwoordig zoo sterk, dat ik tijdens het luisteren naar Bach, dikwijls geïnspireerd word en een sterke drang naar zijn dwingende ritme voel, een cadans die iets van de eindeloosheid zoekt. In de Fuga is alles gebaseerd op een enkel motief, dikwijls maar van enkele noten. Bij mij draait ook alles om een enkele gesloten contour.. But to get back to the point: did you ever imagine that your dad, who lives so far away from the bustle and intrigue of the world, working on his prints day after day like a hermit, would some day be drawn into the sickening scene of vain officialdom, despite himself?.. .But what on earth can I do about it? Luckily I can swear by God and all his angels that I never moved a finger to get the decoration or licked the boots of any bigwigs. In mathematical quarters, the regular division of the plane has been considered theoretically.. .Does this mean that it is an exclusively mathematical question? In my opinion, it does not. [Mathematicians] have opened the gate leading to an extensive domain, but they have not entered this domain themselves. By their very nature they are more interested in the way in which the gate is opened than in the garden lying behind it. After the first proof [of 'Sphere Spirals'] my high expectations were, as always, greatly disappointed. I am now struggling on - with some feeling of despair - so that I at least achieve a passable result. As long as there have been men.. ..upon this globe.. ..we have held firmly to the notion of.. ..all of which must continue to be everlasting in time and infinite in space. The ideas that are basic to [my work] often bear witness to my amazement and wonder at the laws of nature which operate in the world around us. He who wonders discovers that this is in itself a wonder. By keenly confronting the enigmas that surround us, and by considering and analyzing the observations that I had made, I ended up in the domain of mathematics. The fact that, from 1938 onwards, I concentrated more on the interpretation of personal ideas was primarily the result of my departure from Italy. In Switzerland, Belgium, and Holland where I successively established myself, I found the outward appearance of landscapes and architecture to be less striking than those which are particularly to be seen in the southern part of Italy. Thus I felt compelled to withdraw from the more or less direct and true-to-life illustrating of my surroundings. It is human nature to want to exchange ideas, and I believe that, at bottom, every artist wants no more than to tell the world what he has to say. I have sometimes heard painters say that they paint 'for themselves': but I think they would soon have painted their fill if they lived on a desert island. The primary purpose of all art forms, whether it's music, literature, or the visual arts, is to say something to the outside world; in other words, to make a personal thought, a striking idea, an inner emotion perceptible to other people’s senses in such a way that there is no uncertainty about the maker's intentions. Variant translations: Are you really sure that a floor can't also be a ceiling? I can't keep from fooling around with our irrefutable certainties. It is, for example, a pleasure knowingly to mix up two and three dimensionalities, flat and spatial, and to make fun of gravity. To tell you the truth, I am rather perplexed about the concept of "art]. What one person considers to be "art" is often not "art" to another. "Beautiful" and "ugly" are old-fashioned concepts that are seldom applied these days; perhaps justifiably, who knows? Something repulsive, which gives you a moral hangover, and hurts your ears or eyes, may well be art. Only "kitsch" is not art — we're all agreed about that. Indeed, but what is "kitsch"? If only I knew! My work has nothing to do with people, nothing to do with psychology. I am much more cerebral than Willink. I do not wish to be deep at all. I know that I don't hide anything at all in this work. When Carel Willink paints a naked lady in a street, I think: what is that lady doing there?. ..the house facades give me a lugubrious impression. So it is a lugubrious street. My work is not lugubrious. If you ask Willink: 'Why are those naked mistresses there', you do not receive an answer. With me you always get an answer when you ask: why..
version in original Dutch (origineel citaat van M.C. Escher, in het Nederlands): Mijn werk heeft niets met de mens, niets met psychologie te maken. Ik ben veel cerebraler dan Willink. Ik wens helemaal niet diep te zijn. Ik weet dat ik in dit werk niets verberg. Als Carel Willink een naakte juffrouw in een straat schildert, denk ik: wat heeft die juffrouw daar te maken?.. ..de gevels maken op mij de indruk van iets lugubers. Het is dus een lugubere straat. Mijn werk is niet luguber. Als je Willink vraagt: waarom zijn die naakte juffrouwen daar, krijg je geen antwoord. Bij mij krijg je altijd antwoord als je vraagt: waarom..
..and to think now that great mathematicians find my work interesting because I am able to illustrate their theories. They can not imagine that I was such a bad pupil in mathematics. I don't understand it myself neither. I never could understand why it was necessary to prove something that everyone already sees. I saw it, I knew it, so it is how it is… But yes, you had to prove it. I did overcome it when I realized I can make something else - I thought I was a good-for-nothing. In my family there were no other artists to find.. .I was just a weird duck, right? version in original Dutch (origineel citaat van M.C. Escher, in het Nederlands): En als je nu bedenkt dat grote wiskundigen mijn werk interessant vinden, omdat ik in staat ben hun theorieën te illustreren. Ze kunnen zich helemaal niet voorstellen dat ik zo slecht was in wiskunde. Ik snap er zelf ook niets van. Ik begreep niet dat je iets moest bewijzen wat iedereen ziet. Ik zag het, ik wist, het is toch zo.. .Maar jawel hoor, je moest het bewijzen. Ik ben er bovenuit gekomen toen ik me realiseerde, dat ik wat anders kon. Ik dacht, dat ik een nietsnut was. Ik kom uit een milieu waar geen artiesten in waren.. ..Ik was een rare eend in de bijt, he? I first made this one [open spiral in which eyes, mouth and forehead of a woman are recognizable) but I cannot stand it that something is cut off. I thought, why is that human cut off here? Then I made two of them, who have together an [interconnected] endlessness. It is also meant as a reaction against sculptors. I see them as a little inferior - no, that is not well-expressed – but sculptors are too limited. They see sculpturing as something superior, but everybody can do modeling. Drawing is much more difficult, much more immaterial. version in original Dutch (origineel citaat van M.C. Escher, in het Nederlands): Ik heb eerst die gemaakt [een open spiraal waarin de ogen, mond, het voorhoofd van een vrouw herkenbaar zijn ) maar ik kan niet goed hebben dat iets wordt afgesneden. Ik dacht, waarom is dat mens hier afgesneden? Toen heb ik die twee gemaakt, die [met elkaar verbonden] een eindeloosheid hebben. 't Is ook bedoeld als reactie tegen beeldhouwers. Ik zie daar een beetje op neer, nee dat is niet goed gezegd, beeldhouwers zijn te beperkt. Ze denken zelf dat het heel wat is, maar boetseren kan iedereen. Tekenen is veel moeilijker, veel onstoffelijker. Variant: I walk around in mysteries. Each time, youngsters say: you make Op-art too. I don't know what that is, Op-art. This work I have been making for the past thirty years. 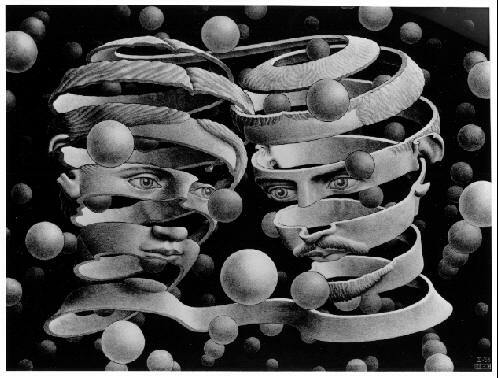 It is a neat depiction of one of Escher's enduring fascinations: the contrast between the two-dimensional flatness of a sheet of paper and the illusion of three-dimensional volume that can be created with certain marks. In 'Drawing Hands', space and the flat plane coexist, each born from and returning to the other, the black magic of the artistic illusion made creepily manifest.